Below are examples of domestic flooring installations in Surrey by Euro-Pean Flooring Solutions, a carpet refurbishment throughout a large six bedroom property that was being prepared for sale, and a natural engineered oak floor fitted to the ground floor spaces and carpet to the bedroom spaces in a new build property. 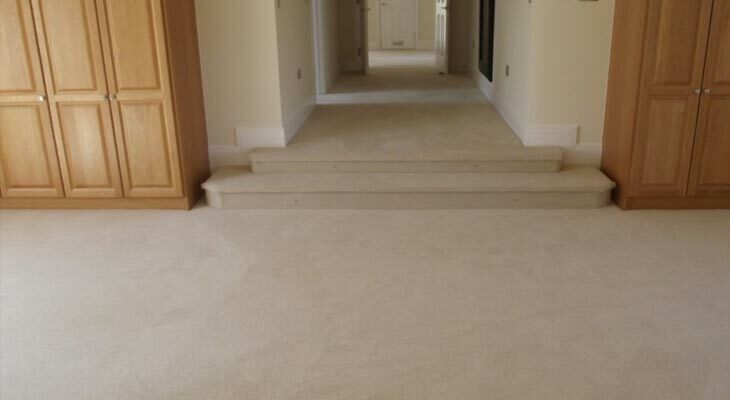 If you require luxury carpet installers or specialist wood flooring installers in Surrey then please don’t hesitate to contact us. 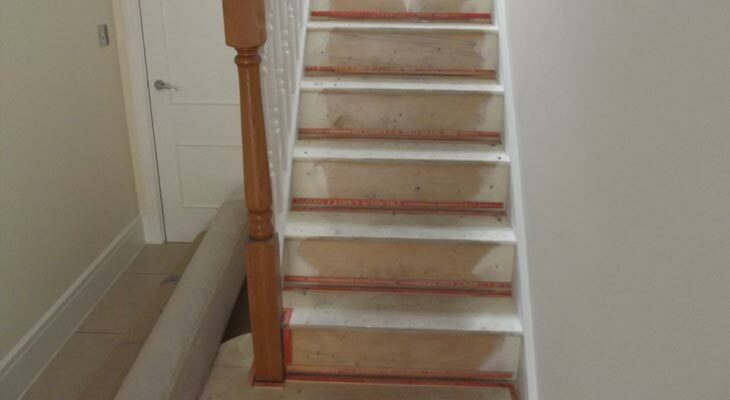 The large six bedroom carpet refurbishment started by uplifting and removing all of the old carpet and associated underlay. 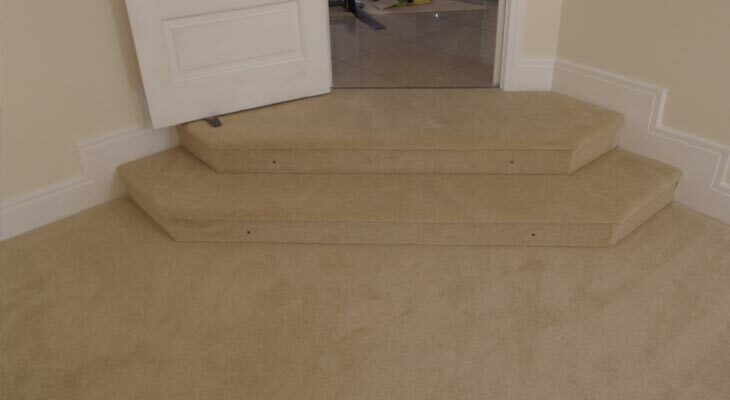 Here is a view of one of the stairs with new gripper rods attached. One of the ground floor living room areas with downward entrance steps and new Cloud 9 underlay fitted (our standard spec underlay). The same ground floor living room area with a new cream velvet carpet fitted (similar to the old carpet but with a good texture and feel). 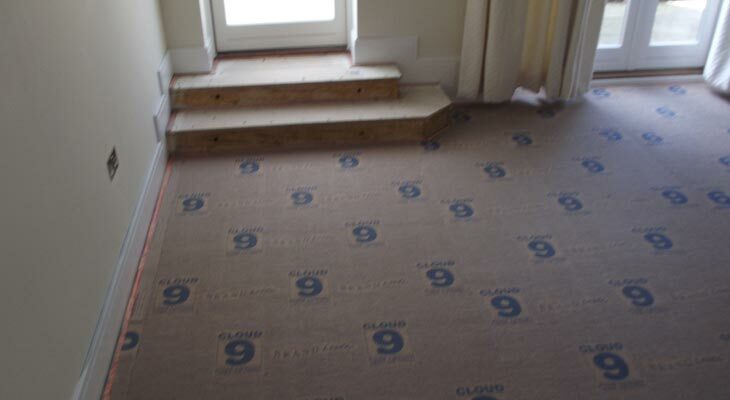 First floor landing, again with new Cloud 9 underlay fitted. 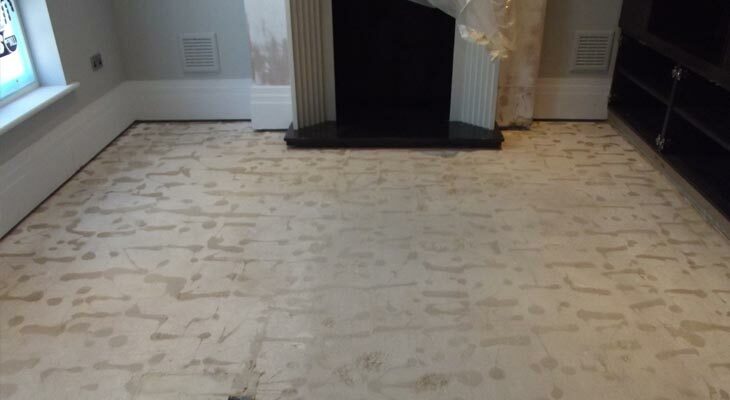 We had a team of three carpet fitters in Surrey working on this refurbishment. 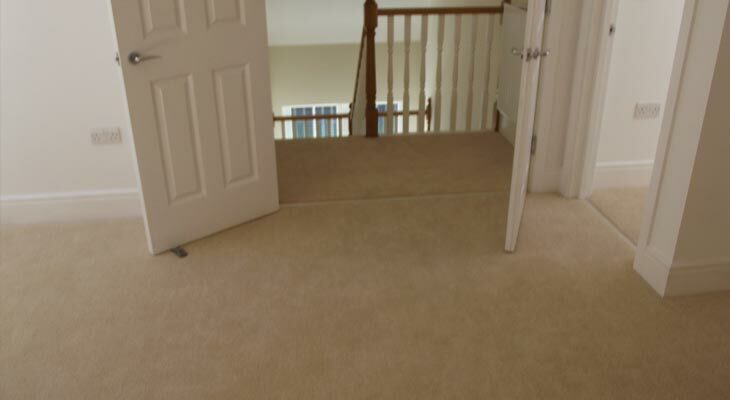 The same first floor landing, again with new cream velvet carpet fitted. Closeup of one continuous piece of carpet coming down the stairs (the stairs did not have a nosing that it could be stapled to). Some stairs are just flat right angles whilst others have protruding nosings which can be made features of. 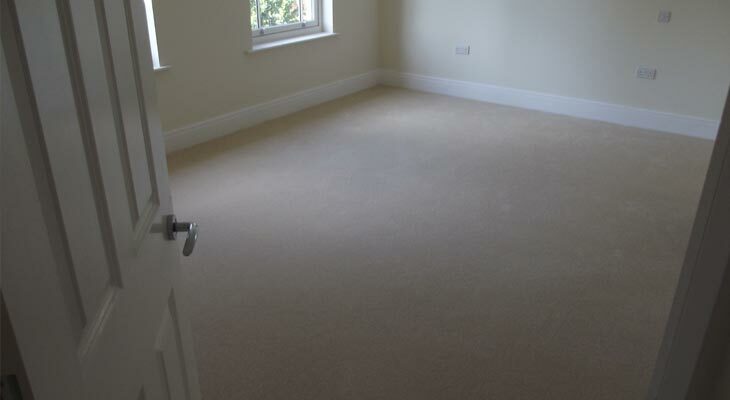 One of the six bedrooms completed with Cloud 9 underlay and new cream velvet carpet fitted. 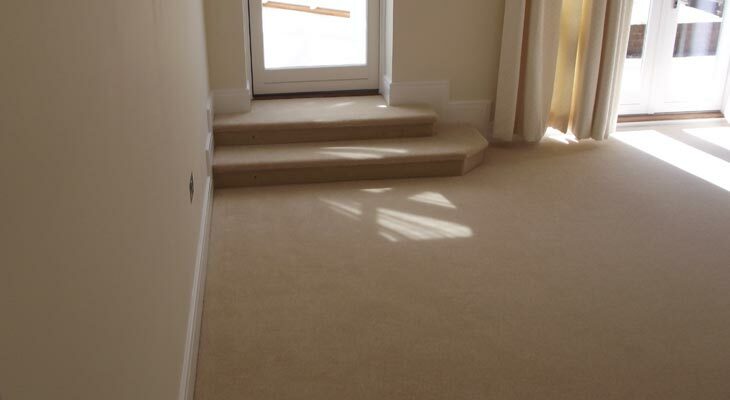 Our specialist carpet installers fitted the cream carpet around the small steps down into the master bedroom. 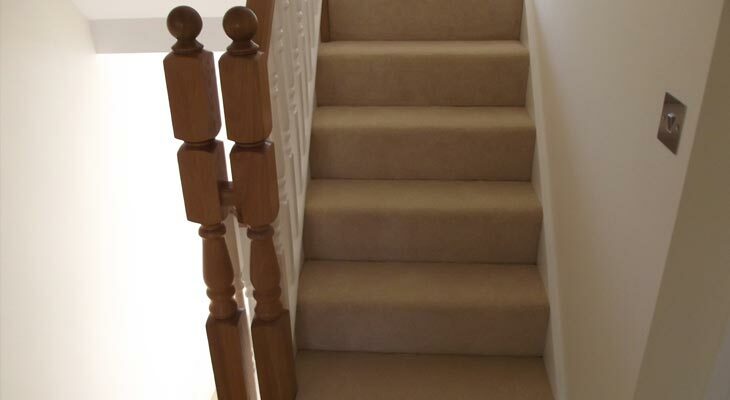 We call this method cap and band, the riser part of the step is fitted with a band of carpet as opposed to the carpet flowing over the top of the nosing. In terms of style it is very much down to the individual. We also had to cut around tiny LED lights housed in the bedroom steps. 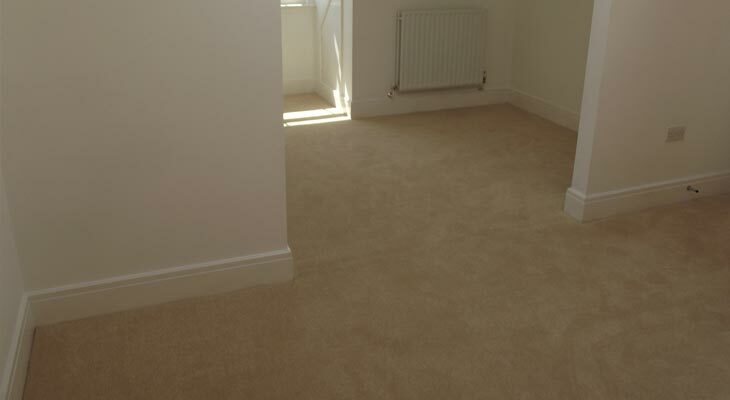 Here is a seamless carpet join to the eaves in one of the bedrooms. 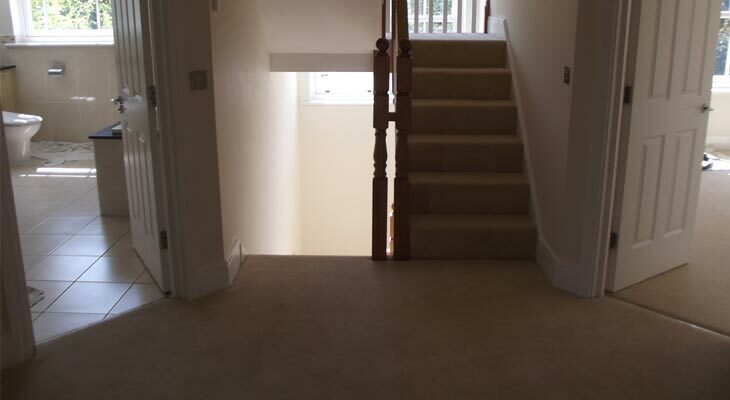 The join was made because the carpet was five metres wide and the room was wider than that. The join runs neatly between each area. Attic bedroom looking out onto the top landing. Door bars were fitted into all of the doorways. Another living room area with downward entrance steps. Again we had to cut around LED lights which were installed as a feature. 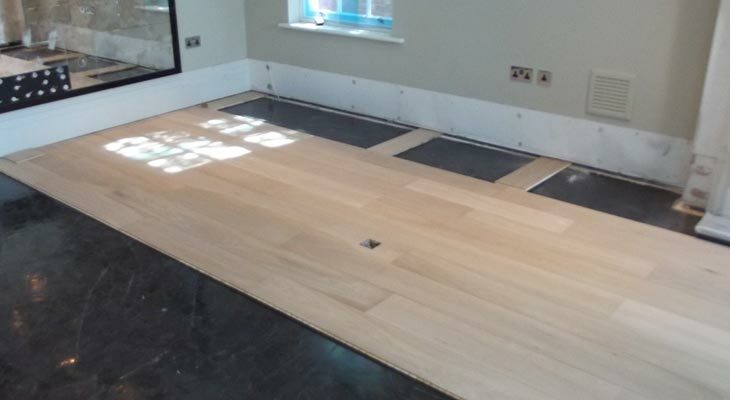 For the property with engineered oak flooring in Oxshott, the sub-floor hadn’t dried out sufficiently to receive wood flooring, so we installed a black damp proof membrane (DPM) that was compatible with the underfloor heating system that was being used. Because the fireplace protruded we started with the middle section and worked our way to the edges (rather than straight off the wall in normal rectangular rooms). Unless you know for sure that the two sides of the fireplace are perfectly parallel, you can run into problems as you progress out to the middle where everything meets and lines up. In cases such as this it’s best to start in the middle and work outwards into either side of the fireplace. 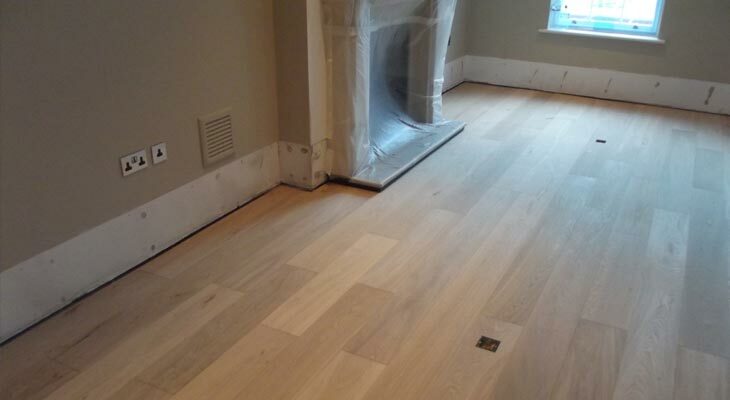 The same room completed with engineered oak wood flooring in Oxshott. The client requested for sockets to be fitted into the floor so we cut small squares into the oak flooring to allow for this. 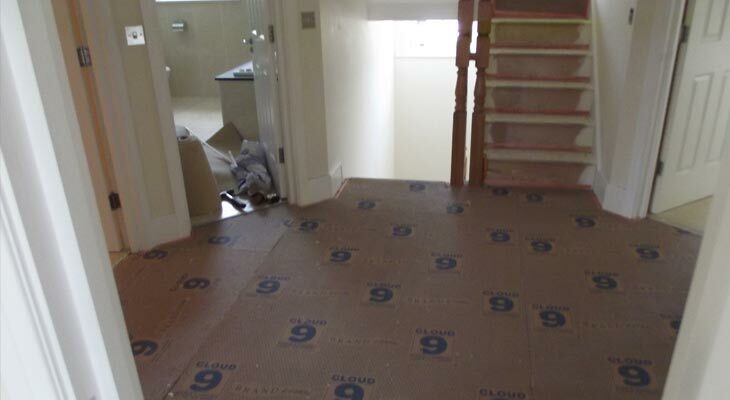 One of the ground floor rooms after applying a latex levelling compound. One of the ground floor rooms nearing completion with skirting boards removed to allow the engineered wood flooring to expand and contract. 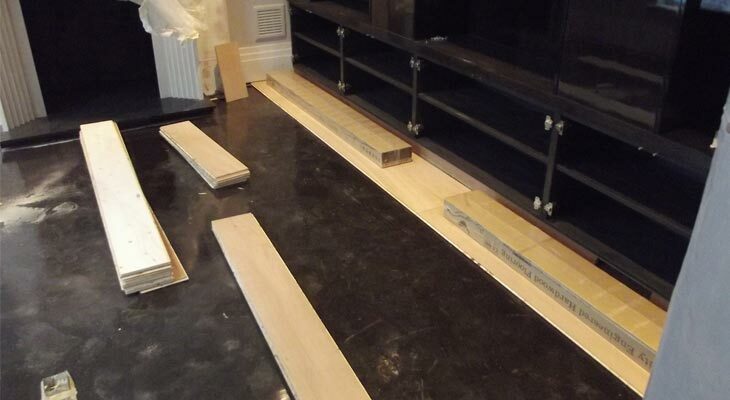 Skirtings are fitted after the installation of the wood flooring. In this ground floor room our original oak flooring was damaged by water ingress from a burst pipe in the ceiling directly above the room. 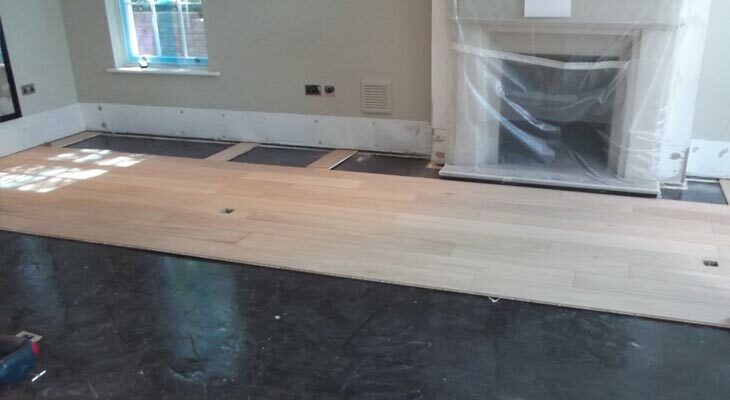 So we were asked back to uplift the damaged wood floor, carry out repairs and fit a new oak floor. 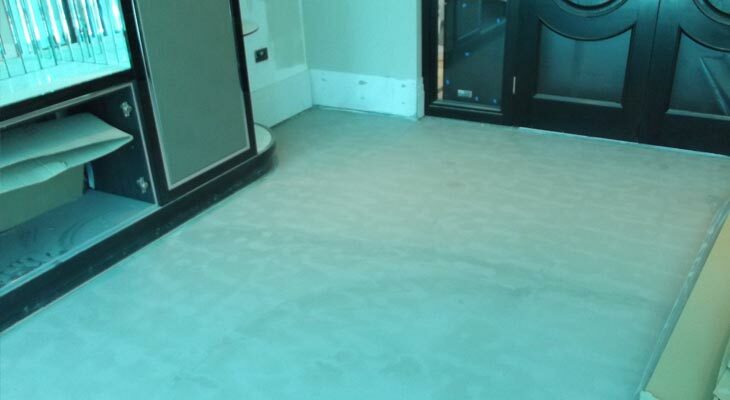 This photo shows the floor following the uplift with remaining bits of adhesive. 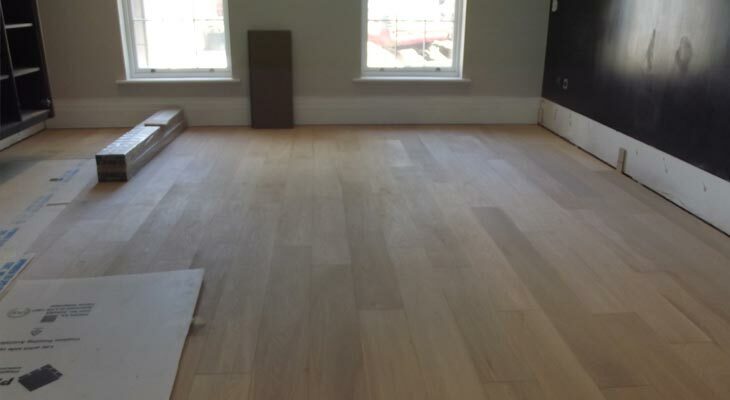 The same room after we have added the levelling compound and a damp proof membrane (DPM) to ensure no moisture from the flood can affect the new top layer of engineered oak wood flooring. The large built in cabinet to the right made the process much more difficult.